Not to be confused with Indian nationality law. An Act to authorize the Secretary of the Interior to issue certificates of citizenship to Indians. SIXTY-EIGHTH CONGRESS. Sess. I. CHS. 233. 1924. See House Report No. 222, Certificates of Citizenship to Indians, 68th Congress, 1st Session, Feb. 22, 1924. Note: This statute has been codified in the United States Code at Title 8, Sec. 1401(b). The Indian, though a man without a country, the Indian who has suffered a thousand wrongs considered the white man's burden and from mountains, plains and divides, the Indian threw himself into the struggle to help throttle the unthinkable tyranny of the Hun. The Indian helped to free Belgium, helped to free all the small nations, helped to give victory to the Stars and Stripes. The Indian went to France to help avenge the ravages of autocracy. Now, shall we not redeem ourselves by redeeming all the tribes? Nipo T. Strongheart, a performer-lecturer on Native American topics at Lyceum and Chautauqua and similar activities across the United States from 1917 to the 1920s,  gathered signatures on petitions supporting Indian enfranchisement into the tens of thousands. Some of his trips into Pennsylvania were in support of Melville Clyde Kelly, a supporter of the bill in Congress, who had a district there. The petitions and other advocacy work helped pass the bill, but he was disillusioned with the results. ^ a b c d NCC Staff (June 2, 2015). "On this day in 1924: All Indians made United States citizens". National Constitution Center. Retrieved September 5, 2015. ^ "1924 Indian Citizenship Act" (PDF). National Park Service. Retrieved September 5, 2015. ^ a b Peterson, Helen L. (May 1957). "American Indian Political Participation". American Academy of Political and Social Science. 311 (1): 116–121. doi: 10.1177/000271625731100113. ^ Haas, Theodore (1957). "The Legal Aspects of Indian Affairs from 1887 to 1957". American Academy of Political and Social Science: 12–22. ^ Haney López, Ian (2006). White by Law: The Legal Construction of Race. New York University Press. ^ a b c d e Bruyneel, Kevin (2004). "Challenging American Boundaries: Indigenous People and the 'Gift' of U.S. Citizenship". Studies in American Political Development. 18 (1): 30–43. 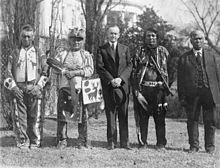 ^ Paul Rosier, Serving their country: American Indian politics and patriotism in the twentieth century, 46. ^ a b Lori Lynn Muntz (May 2006). Representing Indians: The Melodrama of Native Citizenship in United States Popular Culture of the 1920s (Thesis). Department of English, University of Iowa. p. 265. ISBN 978-0-542-79588-6. UMI3225654. Retrieved August 26, 2014. ^ Prengaman, Kate (August 10, 2014). "Pride for his people – New displays at Toppenish museum celebrate life and influence of Nipo Strongheart, a Yakama with a passion for Indian rights". Yakima Herald-Republic. Yakima Washington. Peters, Gerhard; Woolley, John T. "Calvin Coolidge: "Radio Address from the White House on the Duties of Citizenship," November 3, 1924". The American Presidency Project. University of California – Santa Barbara.